Are you reading the title to this post and feeling confused? Well, that’s ok because you’re right to be a bit confused. 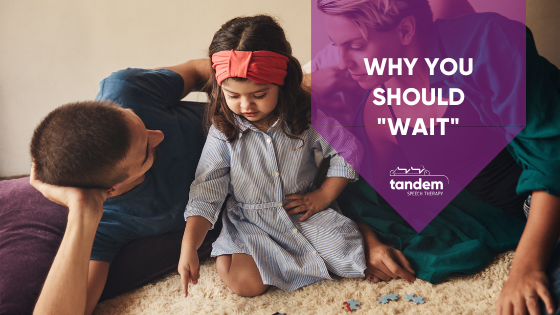 I have shared how important early intervention is with you and why taking a “wait and see” attitude may not be the best path for your child. So what is this all about? Waiting is a powerful technique I use in speech therapy to support a child’s use of words and language building. It’s also an important lesson I teach in all my Hanen classes. A fundamental lesson in the Hanen ‘It Takes Two to Talk’ program is called OWL. This stands for Observe, Wait, Listen. 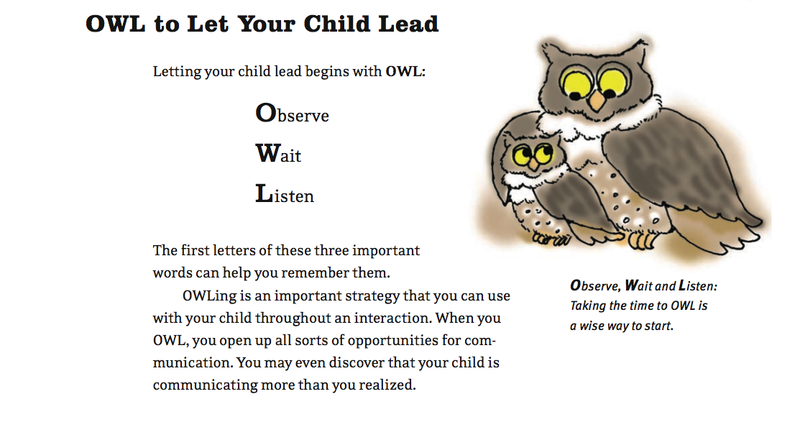 When you OWL with your child, you open up more opportunities for communication. Before I get into why it’s so important to wait, I want to highlight another important strategy to use when interacting with your child. Try to start interactions by getting face to face with your child. Face to Face time with your child provides time to connect more easily and share the moment. When you can see each other and hear each other, you begin to understand each other’s messages better. It is easier to encourage your child to communicate when you are face to face with them. Now that you are face to face with your child it’s important to also wait. As a pediatric SLP, I do a lot of talking but I also spend time with children waiting. Waiting is an incredibly powerful tool. Waiting gives your child a chance to either initiate an interaction or respond to something you have said or done. When you wait, you are also giving you child extra time to process information. This is particularly helpful for children with a language delay that often require extra time to process auditory information. The most important thing about waiting is to give your child enough time to understand that you are expecting him/her to send you a message. The message can take lots of forms–a sound, a word, a gesture. Anything your child does to make their needs known is a message. Want to learn more strategies to support your child's development?